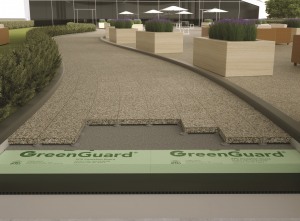 Kingspan Insulation has expanded its commercial product offering by introducing GreenGuard Type VII XPS Insulation Board. The product is designed for high load-bearing engineered applications requiring insulation with a minimum compressive strength of 60 psi. According to the manufacturer, Type VII XPS is primarily used in commercial roofing applications, such as protected membrane and pedestal paver systems. According to the manufacturer, the insulation board offers an R-value of 5.0 per inch of thickness and meets ASTM C578 Type VII requirements. The product retains its insulating properties over time, has high water resistance and is HCFC-free. In addition to commercial roofing applications, it also is suitable for low-temperature freezer floors, cold-storage facility floors, ice rinks and parking decks.